Archaeology Live! Summer 2014. Week 5. After many successful years of Archaeology Live! 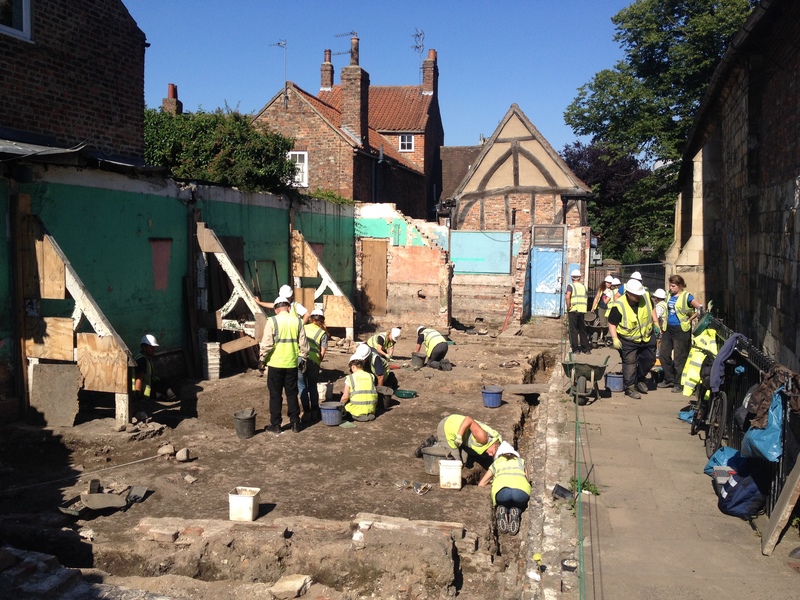 on Hungate, one of the great pleasures of this season has been the opportunity to get to grips with a whole new site. We have taken the exciting step of crossing the River Ouse and begun an excavation within the colonia of the Roman city, after thirteen seasons nestled safely in or around the fortress. New sites bring new challenges, but thankfully the rich archaeological deposits of York have yet again failed to disappoint. At Archaeology Live! we are great believers in throwing our trainees in at the deep end. We always endeavour to have a site stripped of overburden and ready to excavate before the first trainee steps foot into the trench. This means the people that dig with us spend the entirety of their stay working on stratified archaeology – we leave the joys of clearing topsoil to our long suffering staff! What are these edges everyone keeps talking about? 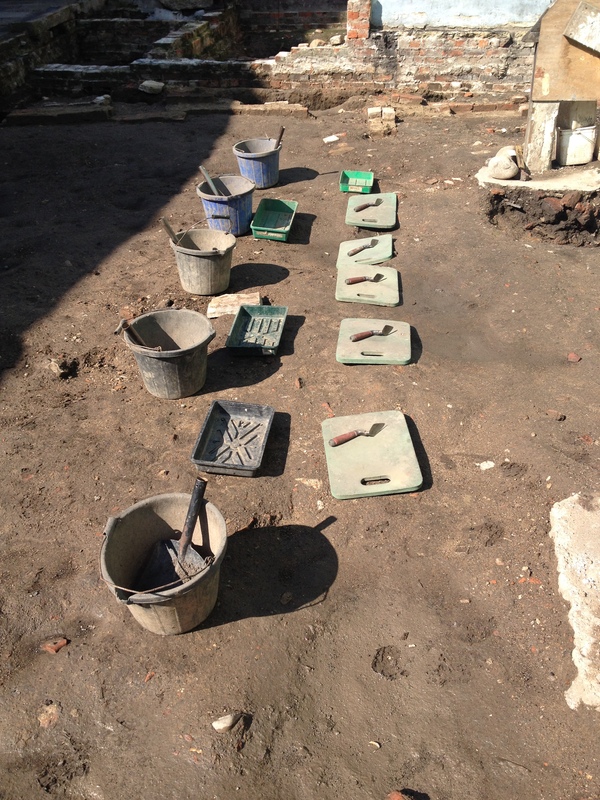 Urban archaeology is a complicated beast. The merry olde city of York has been constantly occupied for over two millennia, its citizens seemingly obsessed with digging pits and filling them in again. 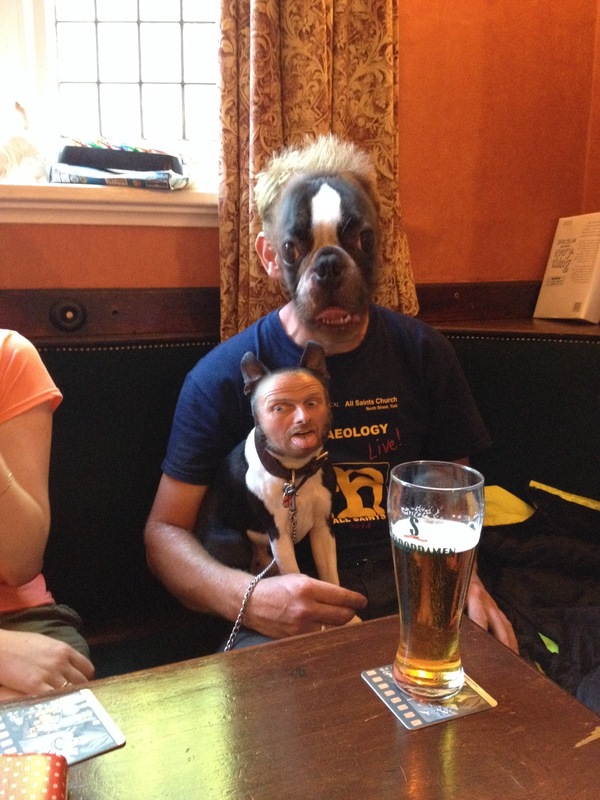 This makes for a complex mess of confused edges and interweaving deposits. That said, the week 5 Archaeology Live! 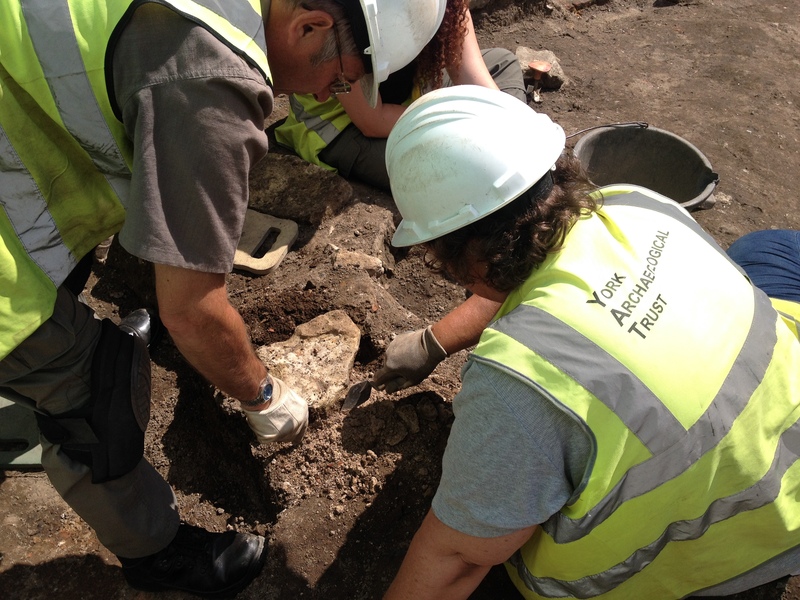 team were more than up to the task of picking apart this archaeological jigsaw. 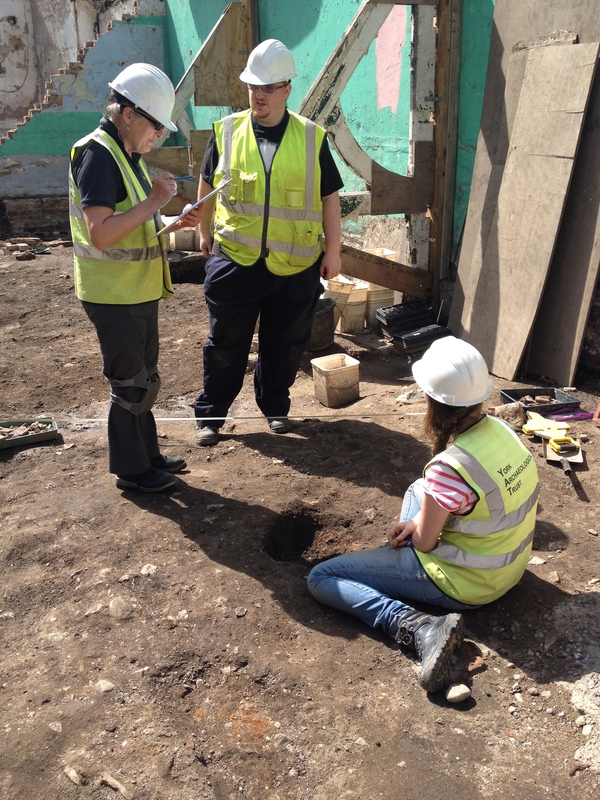 In Arran’s area, Arleanne, Beverly and Katie (from the USA, Canada and Scarborough respectively) began their week by excavating a small post hole. Sealed by the seemingly endless C19th builder trample, this was one of the first pre-1860s features to be identified and its dark, charcoal-rich fill was highly visible. With this recorded, it took a full day of trowelling to reveal the next context in the archaeological sequence – that most glamorous of deposits, a dump. Katie and Beverly recording their post hole. 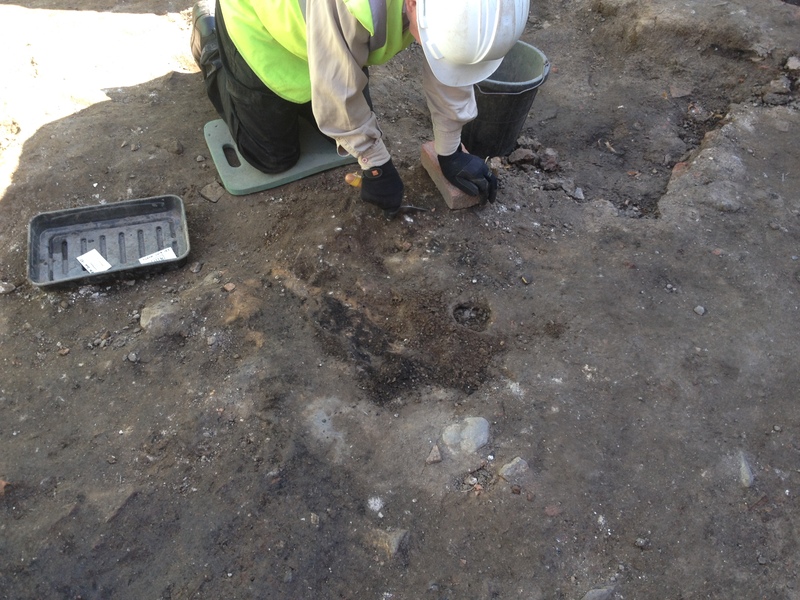 As with so many other contexts across the site, this early-mid 19th century dump deposit contained pottery dating from the Roman to early-Victorian periods. Katie and Beverly hunting edges. Beverly added yet another decorated clay pipe bowl to our burgeoning assemblage. This particular example featuring a floral decoration. 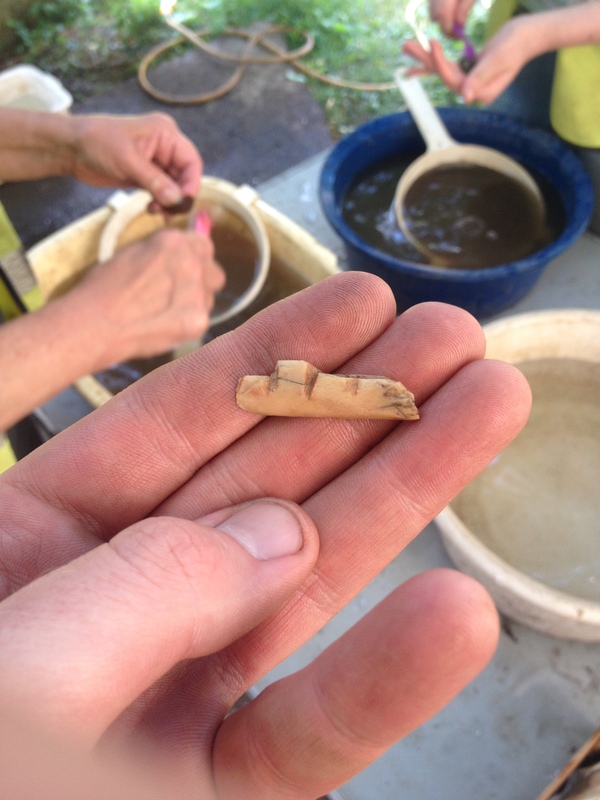 Beverly’s clay pipe bowl fragment. With the sun beating down, Katie, Beverly and Arleanne carefully pealed away the mixed dump deposit, before seeing their hard work rewarded with the clear edge of a rectangular cut feature. By the end of the week, the team had begun to excavate the upper fill of this feature and had recovered a good amount of medieval to post-medieval pottery. Katie looking suitably delighted upon discovering the edges of a new feature. With its size and orientation, it is possible that this feature may be a burial, although it is equally possible that it could turn out to be a pit. This will be investigated next week and any human remains that may be discovered will not be removed during this project. 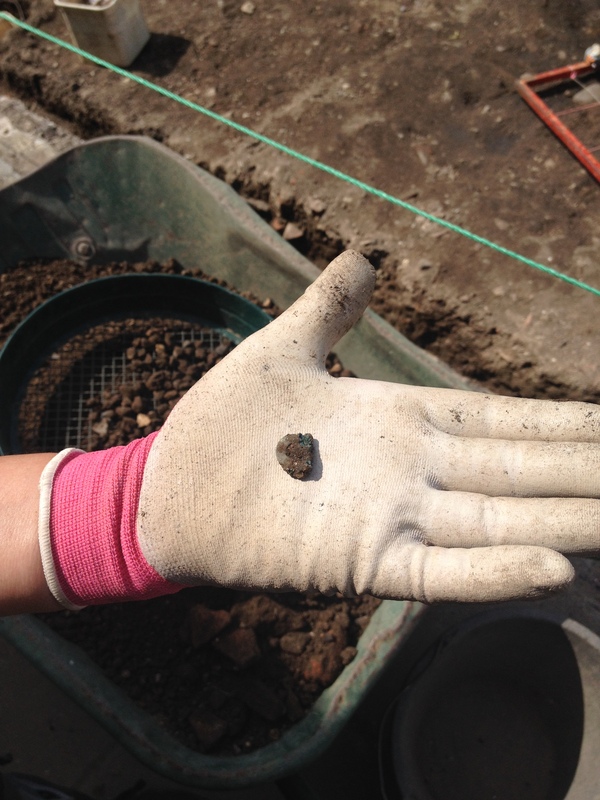 While work is ongoing on this context, an intriguing find was recovered during the dry-sieving of its backfill – a small, circular copper object. Too thick to be a coin and not an obvious shape for a button, it will be down to our conservation team to solve this riddle. Beverly’s enigmatic copper alloy object. Elsewhere in Arran’s area, Anne and Terry were also seeking out the next feature in their sequence. After a thorough clean of their area, it became apparent that the latest feature was a stone post-pad. 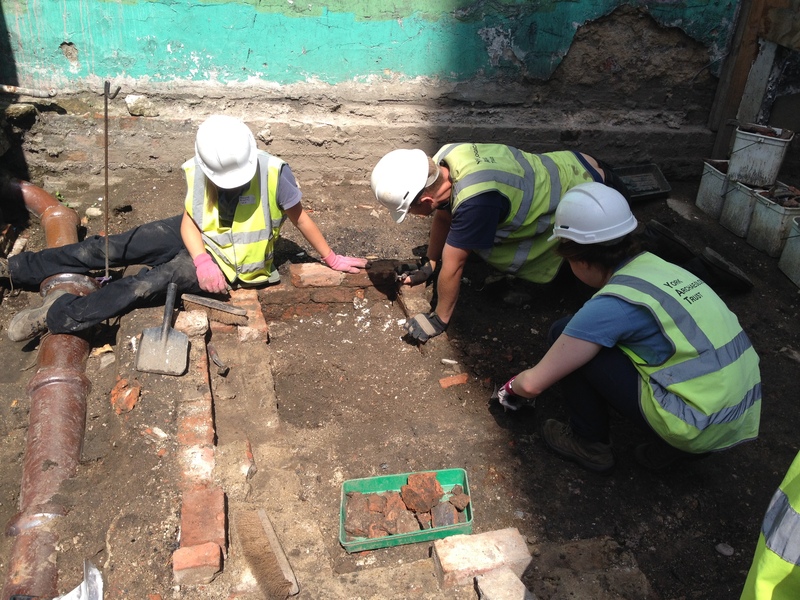 An exciting possibility relating to numerous structural features in this area is that the surviving row of buildings now known as All Saints Cottages (built c.1396) may once have extended into our trench. The present day buildings exhibit structural timbers sitting atop stone post-pads not dissimilar to this feature. 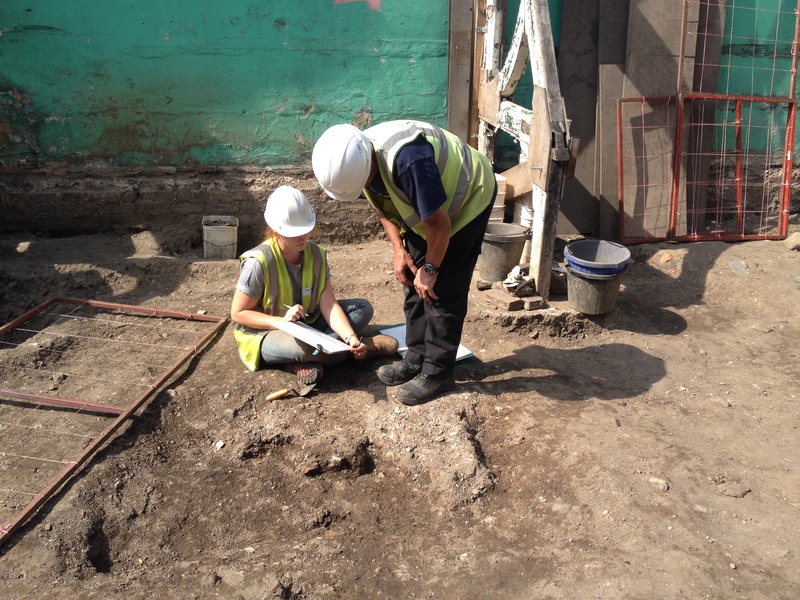 Anne and Terry excavating a post-pad that may once have been part of All Saints Cottages. With the post-pad recorded and removed, Anne and Terry then recorded another dump deposit which yielded some lovely ceramics. Beneath this deposit was a pleasant surprise, a truncated fragment of a well-laid cobble surface. 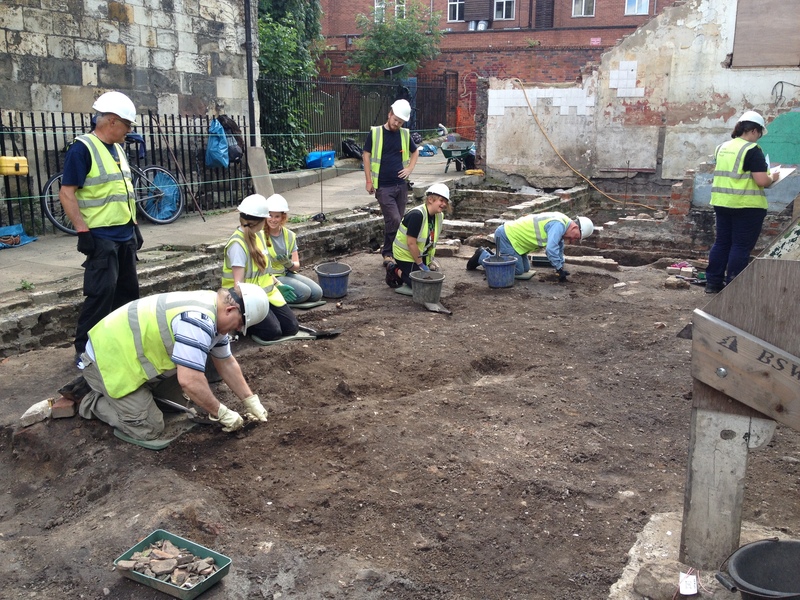 Whether this proves to be a structural footing, or part of an early yard, it is great to see this area beginning to settle into a clear sequence. Anne beginning to expose her cobbled surface. 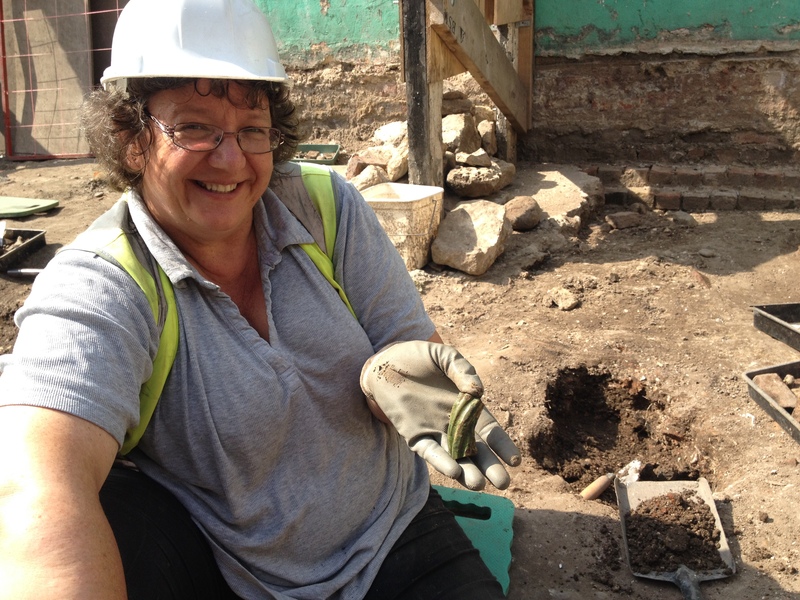 Anne and Terry ended their week by recording and beginning excavation on two deposits sealed by their dump. Terry’s context proved to be yet another layer of dumping reminiscent of laminated yard deposits. 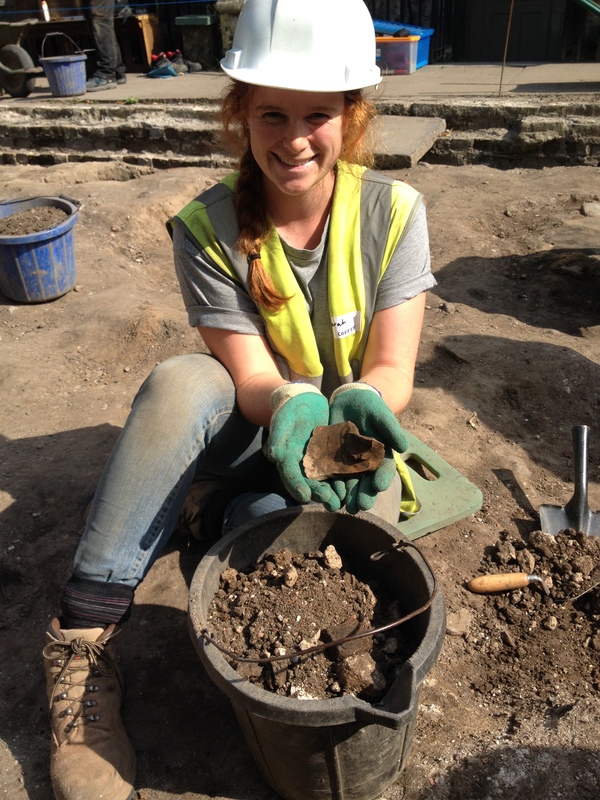 Anne’s small scatter of bone-rich material proved to be the upper fill of a large pit full of animal bone. This is exciting evidence of butchery activity occurring on site and a rare example of a pit being used for one focused activity other than domestic refuse disposal. A finds highlight was the handle of a medieval, green glazed jug. Work will continue on this pit next week. A decorative, twisted medieval jug handle. At the north-eastern extreme of the trench, Gideon and Jess took custody of what we have come to know as Complicated Corner. In this area, numerous layers of dumping and trample have already been recorded and lifted, punctuated with small pits and post-holes. This week, yet another dump deposit was uncovered and removed, revealing a confusing mass of ephemeral edges. Gideon and Jess peeling away a dump deposit. 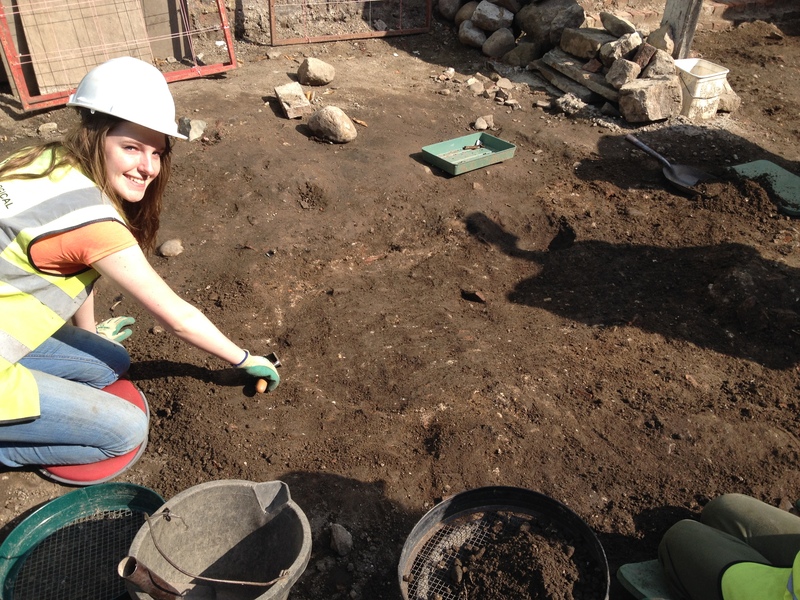 The painstaking trowelling of Gideon and Jess paid dividends as they revealed the backfill of a rectangular pit, alongside the beginnings of a structured dump of rubble. 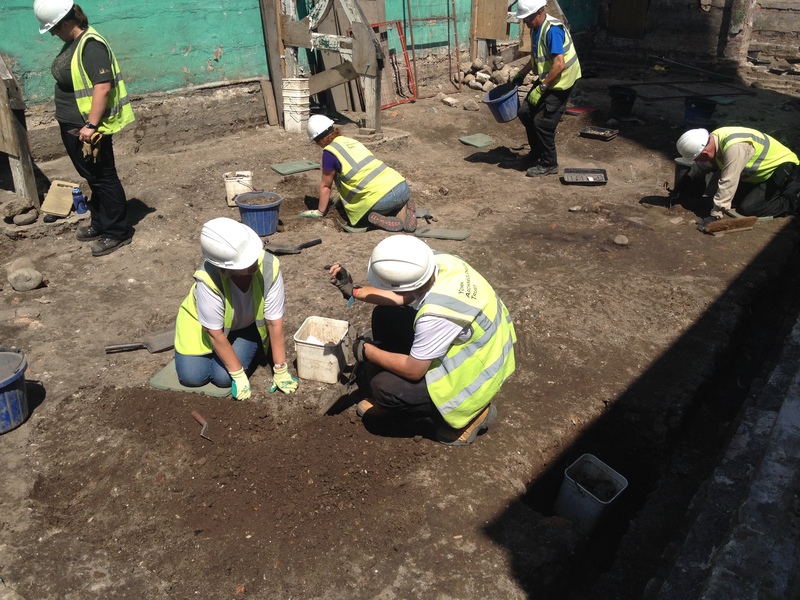 The pair began work on recording and excavating their pit at the end of the week and up to press, it appears to contain ceramics of a date no later than the late 1700s. We do indeed seem to be creeping back in time in this area, despite the complex nature of the archaeology! As this area finally, if reluctantly, yielded some good edges, it has now been re-named Contrary Corner. Gideon and Jess showing off their medieval finds. Tom and Gill joined Arran’s team on a two day taster course this week and joined the effort of finding new contexts that had previously been sealed by the 1860s construction trample. Exposing another bone-rich deposit, they began to excavate a second pit full of butchered animal bone. Tom and Gill hard at work on their pit. Filled in particular by fragments of cattle skull, this deposit would have been rather pungent when fresh! As work progresses on this area, it is becoming possible to see evidence of the zoning of activity. Two neighbouring pits full of primary butchery waste strongly suggest that meat processing had been occurring on-site. Hopefully more trends will appear in the coming weeks that will continue to give us a flavour of the site’s many past lives. Team This End hard at work. Over in Toby’s area, the search for new edges was equally ambitious. Close to the 18th century rectory, it quickly became apparent that the area had been a busy and well-used yard space. 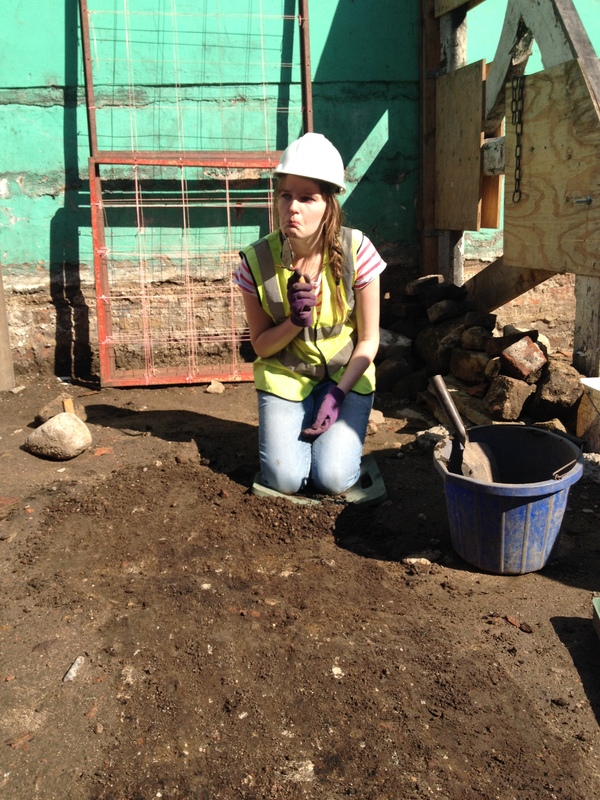 The team began the week by cleaning up, recording and excavating a new layer of trample. As Team This End stripped away this layer of trample, a number of earlier deposits were revealed. Toby’s team working on numerous yard deposits. Jim spent a lot of time cleaning up a patch of burning with particularly tricky edges. As the deposit was cleaned, it became clear that a number of shallow cuts post-dated the burning event, yet again emphasising the busy nature of deposition in this area. Persistence again paid off however, as Jim pieced together the sequence and began to record and lift the latest deposits, proving himself a dab hand with a trowel! Jim begins work on an intriguing area of burning. 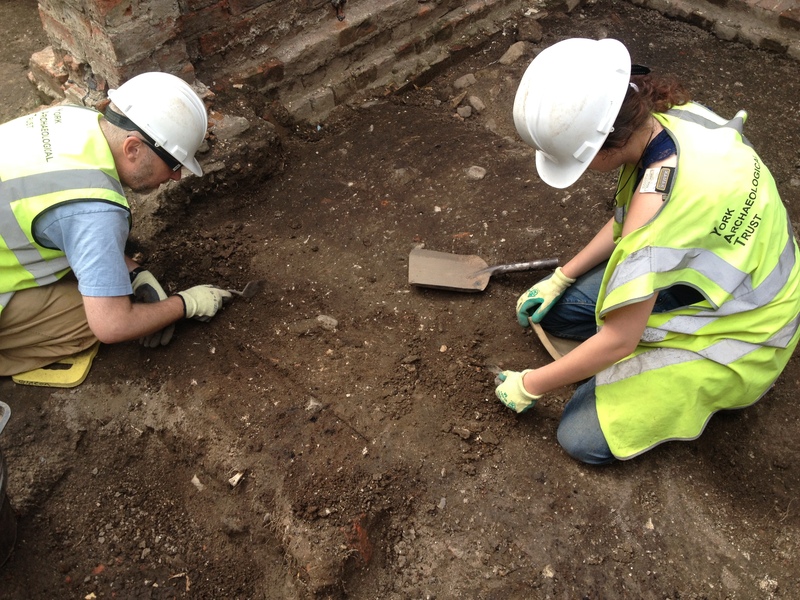 Bill and Sarah also put in a fair shift of trowelling, themselves revealing a distinct layer of mortar. True to form, the edges of this deposit were subtle at best. Recording a mysterious mortar filled feature. 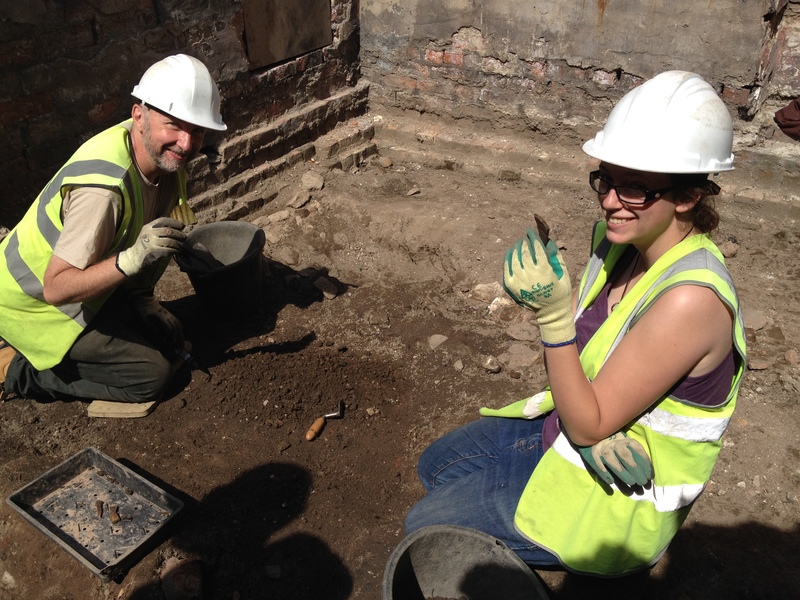 With their deposit recorded, Bill and Sarah began to excavate the mortar layer and it wasn’t long before they were rewarded with an exciting find; a large sherd of a Roman amphora. Used to transport wines and oils, these large vessels were a mainstay of Roman trade and hint that luxury goods were being consumed close-by in the Roman period. Elsewhere in ‘This End’, Minty and Coco were revealing an increasingly complex sequence relating to the old rectory building. What we had presumed would be a simple external wall was proving to be much more complicated. With a series of dumps and wall adjustments and re-builds becoming visible, this part of the rectory could possibly correspond with an odd porch structure marked on an 18th century engraving of the building. Minty, Toby and Coco ponder their sequence. 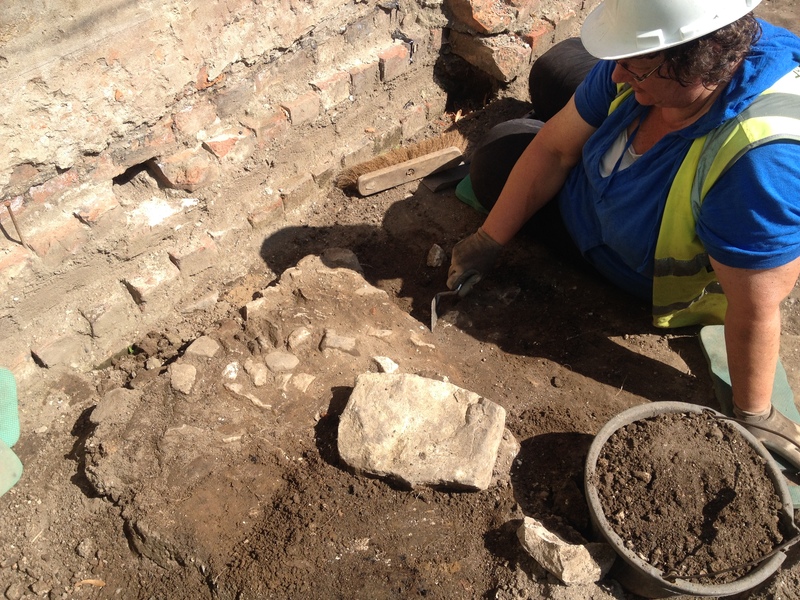 A number of interesting finds were revealed as Minty and Coco excavated a small pit close to the rectory wall, including an unusual early C19th glass bottle. Minty displaying a fragment of a glass bottle. 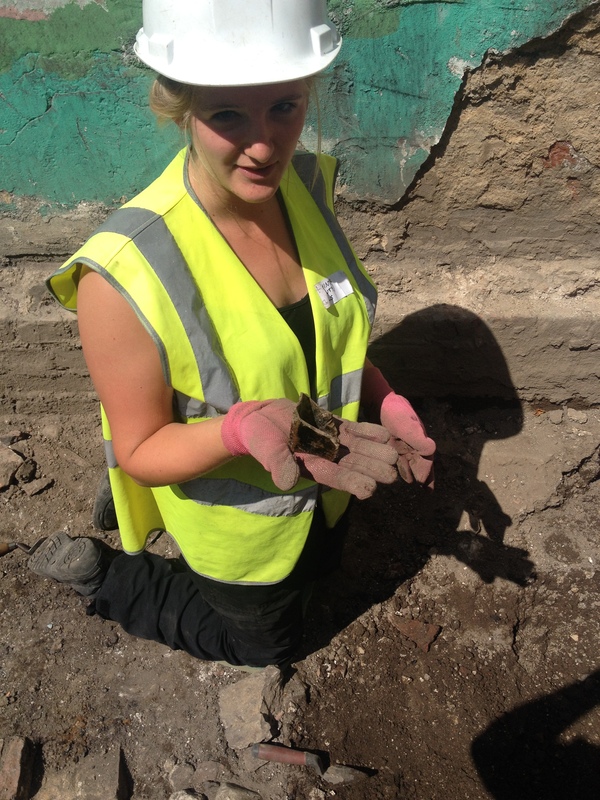 In the same feature, Coco was lucky enough to find a fragment of medieval floor tile, that was almost certainly once part of the church floor. Again, comparison with the current floor of the Lady Chapel (which was based on excavated finds) proved to be a perfect match, glaze and all. 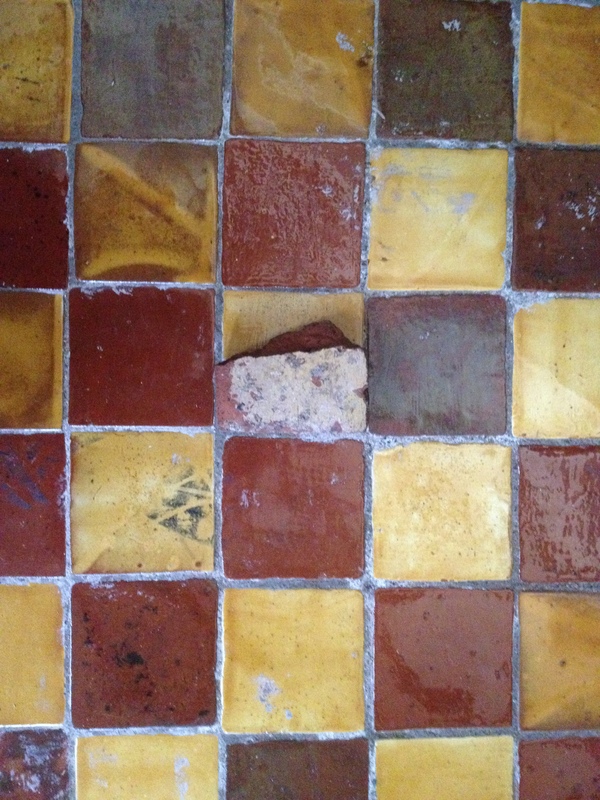 A freshly unearthed floor tile, reunited with the present church floor. 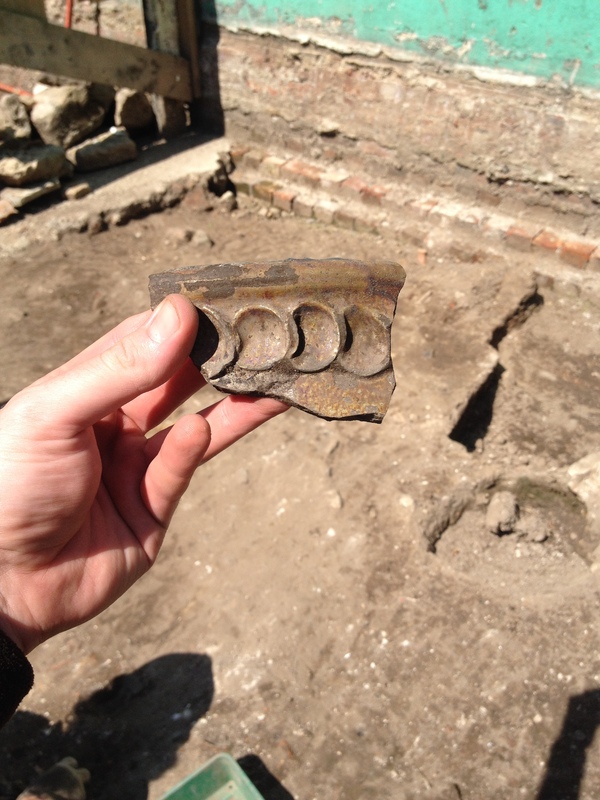 Elsewhere in Toby’s area, the finds were coming thick and fast! 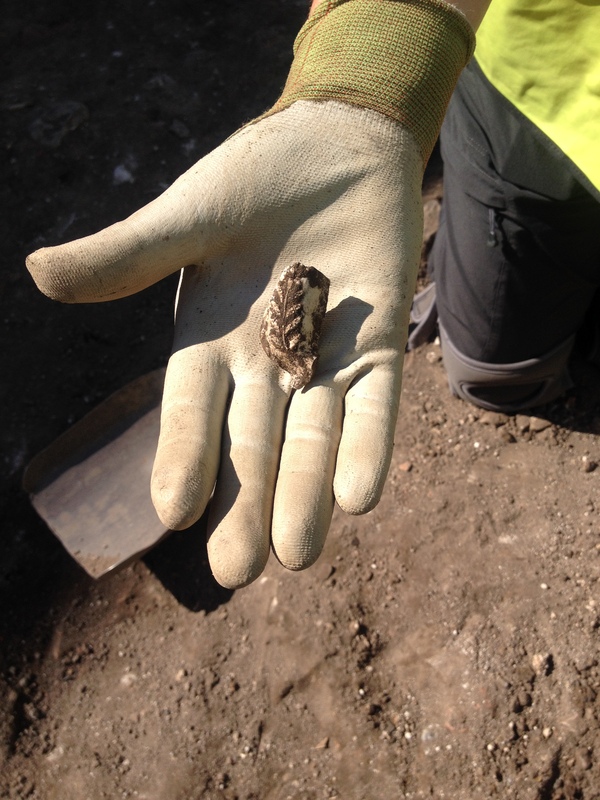 Jackie, digging with us on a one day taster, was delighted to find a fragment of a worked bone clothing pin, similar to a number of Viking examples found on Hungate. Jackie and her worked bone object. 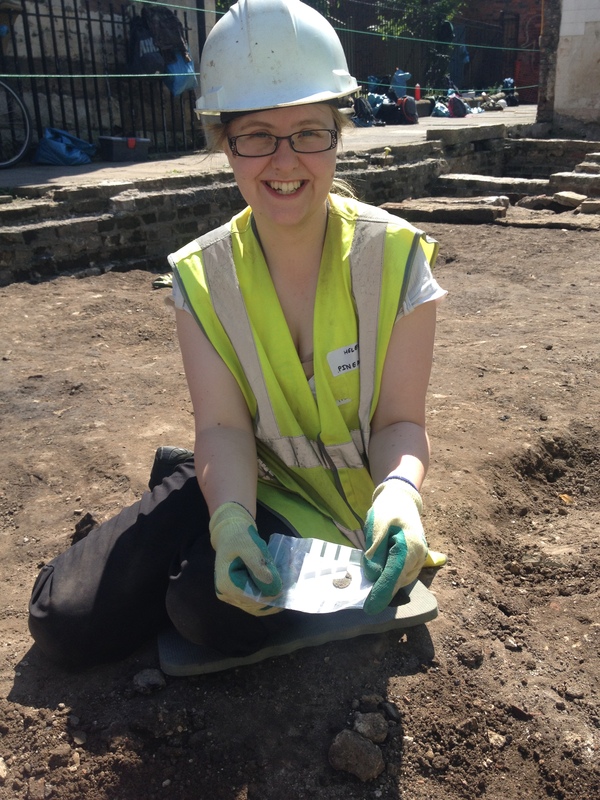 Cleaning up the latest trample layer provided returnee Helen a chance to find her second medieval coin in two years! While fragmentary, the coin is well preserved and should be dateable once cleaned. 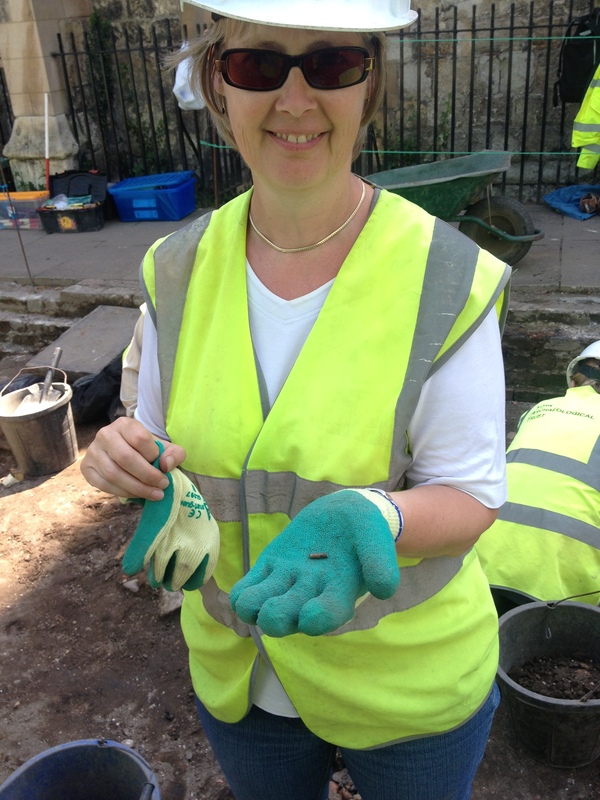 Helen finds a medieval coin… AGAIN! Archaeology Live! 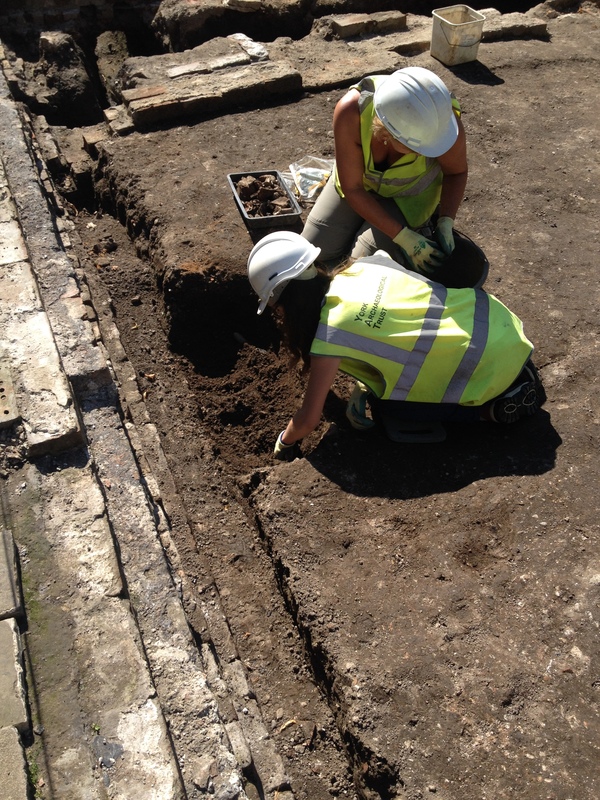 regular Sharon teamed up with new trainee Lucy to work on a small rectangular feature. This was one of the first features in This End to reveal a clear edge and proved to be surprisingly deep! Containing a mix of Roman to post-medieval pottery, the pit was excavated to a depth of around 400mm. While the feature was not bottomed, it will be far easier to resume excavation once the surrounding area has been reduced. As it could possibly represent a burial, this will be a feature that certainly warrants a cautious approach! 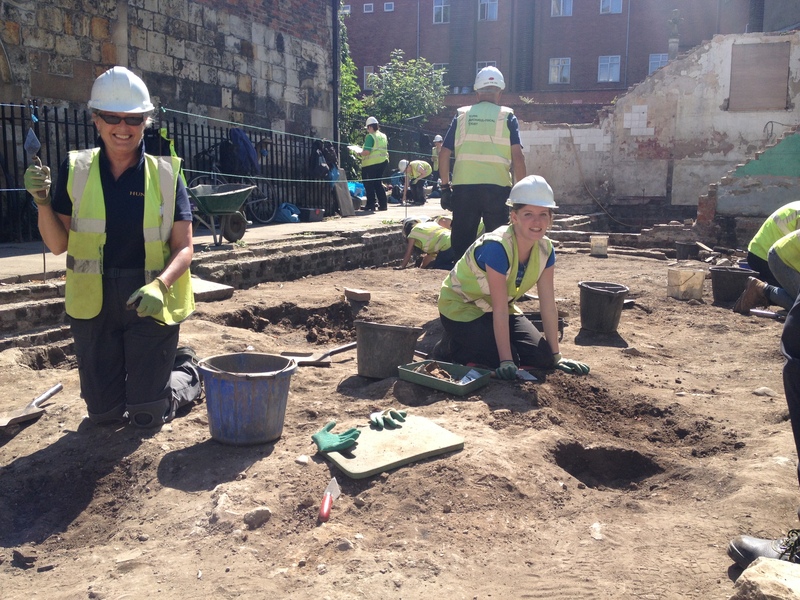 Sharon and Lucy hard at work in their increasingly deep pit. 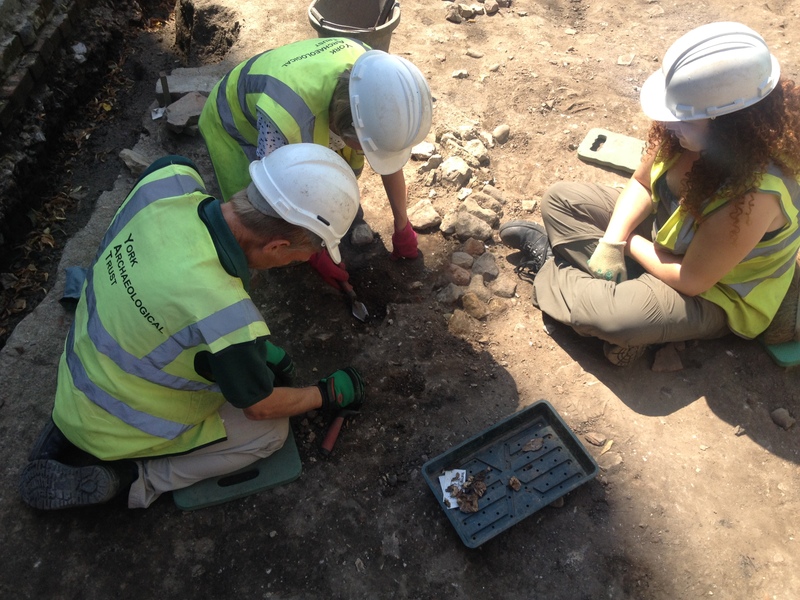 Under the shade of the Finds Tree, Gary and his team continued to shed new light on the site with the ongoing work of finds processing. The site is producing an impressive assemblage of butchered animal bone, a key insight into past diets. Many fragments of bone exhibit clear butchery marks, allowing us to see how meat was processed and what species were preferred. The base of a dog skull was an unusual find within a domestic waste assemblage, proving that not all ‘pets’ were buried carefully during the early 19th century! 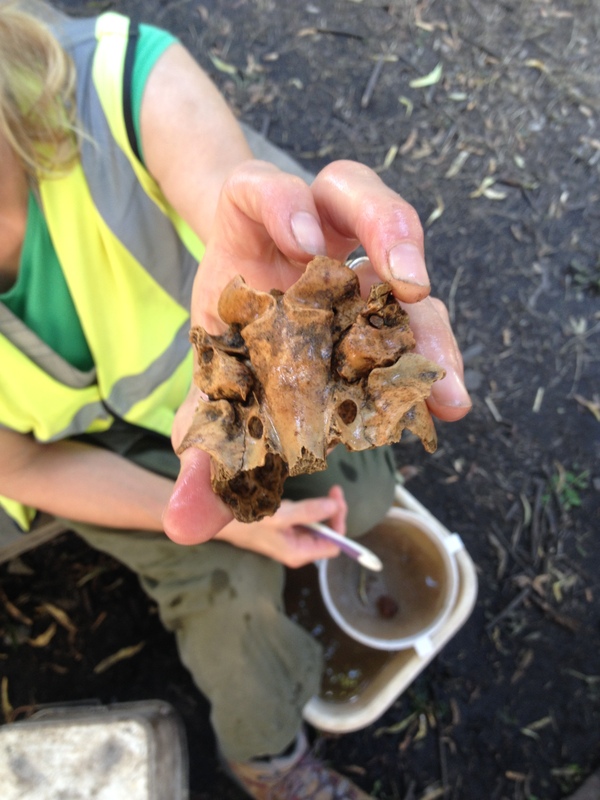 Arleanne displays a fragment of a dog skull during cleaning. The week was rounded off with the usual specialist sessions on conservation, small finds, pottery, animal bone and stratigraphy. 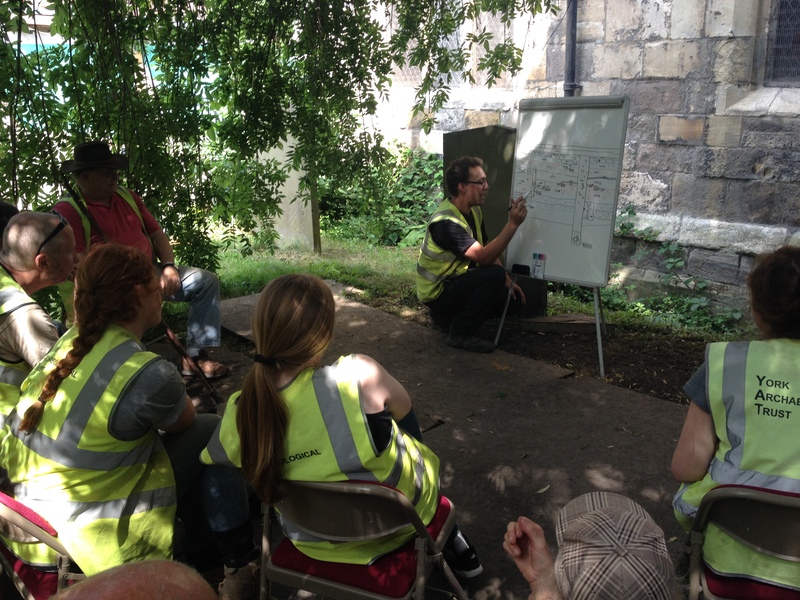 These sessions provided a chance to escape the fierce sunlight and to get to grips with some new aspects of archaeology. Gary begins his stratigraphy masterclass! The week 5 team continued to maintain the high standards set so far in the summer session. 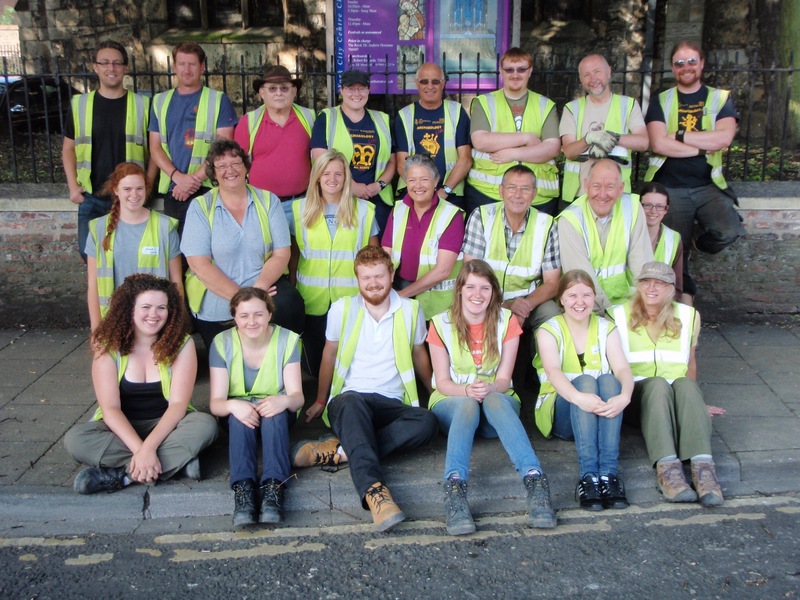 It’s been a continuing pleasure to work with such a diverse and motivated team and, as everything we do at Archaeology Live! is entirely funded by our trainees, it is important to recognise their hard work and enthusiasm. 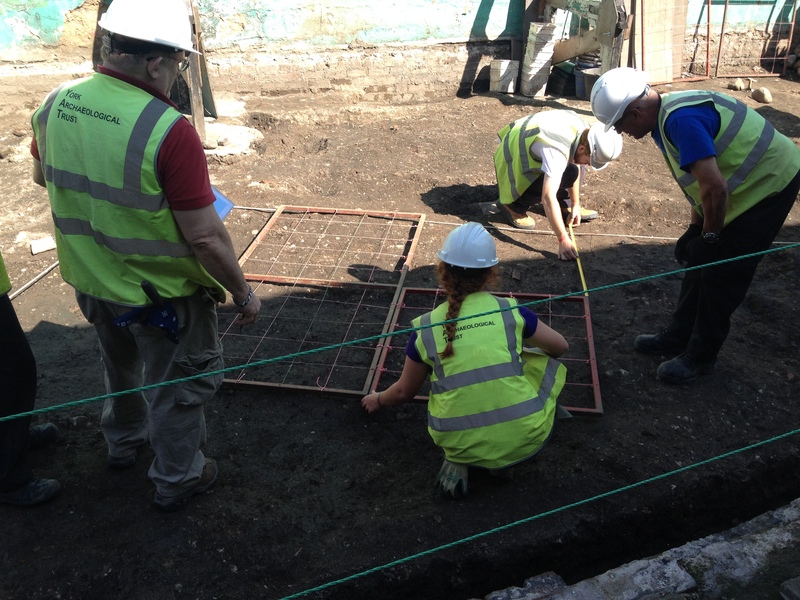 Thank you to all our trainees, tasters and placements for another thrilling week of archaeological discovery. As we delve further into pre-boxing club layers, we are really beginning to get a taste of the site’s story. The most encouraging fact is that we are barely halfway through the season! Here’s to next week’s exciting discoveries! Archaeology Live! Summer 2014. Week 4. Archaeology Live! Summer 2014. Week 6.